NACOGDOCHES, Texas - The College of Fine Arts at Stephen F. Austin State University will present five exciting national touring acts in the highly diverse 2018-19 University Series. It offers something for everyone: comedy, a string quintet, bluegrass, African-American dance and contemporary Mexican music. Additionally, two Encore Events will provide even more varied musical programming with a true jazz legend and a rock legend reincarnated in the world's most authentic tribute to the late, great Prince. Ticketing for Encore Events is separate from the University Series. "Deep East Texas audiences love performances of all kinds, so we really cranked up the variety for 2018-19," said Scott Shattuck, associate dean of the College of Fine Arts and director of the series. "Professional theatre, exhilarating contemporary dance and five very different musical styles make for fun and fascinating nights out for folks with a wide range of tastes in entertainment." All performances are at 7:30 p.m. in Turner Auditorium in the Griffith Fine Arts Building, 2222 Alumni Drive, on the SFA campus. 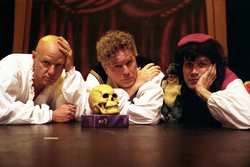 The Reduced Shakespeare Company in "The Complete Works of William Shakespeare (abridged) [revised]" will take the audience on an irreverent, hilarious romp through the Bard's 37 plays in 97 minutes. The show, coming to SFA on Tuesday, Sept. 11, is written by Adam Long, Daniel Singer and Jess Winfield, with additional material by Reed Martin, and directed by Martin and Austin Tichenor. Join the madcap men in tights as they weave their wicked way through all of Shakespeare's plays in one wild and memorable ride that has left audiences helpless with laughter from Los Angeles to London. The first Encore Event of the season brings NEA Jazz Master, renowned Grammy Award-winning saxophonist and Tony Award nominee Branford Marsalis to Turner stage on Wednesday, Oct. 10. One of the most revered instrumentalists of his time and leader of one of the finest jazz quartets today, Marsalis is a frequent soloist with classical ensembles. His most current quartet recording is "Four MFs Playin' Tunes." "An Evening with Branford Marsalis" is sponsored in part by Elliott Electric Supply. Known for its startlingly eclectic repertoire (from Piazzolla to Brubeck to Radiohead) as well as its commanding performance style, SYBARITE5 comes to SFA Thursday, Oct. 18. SYBARITE5 is turning heads throughout the music world. With knockout engagements in 43 states and counting, SYBARITE5 has wowed audiences at venues such as Carnegie Hall and Lincoln Center. The performance is sponsored in part Cataract, Glaucoma, Cornea & Retina Consultants of East Texas/Benchmark Optical/Medical Arts Surgery Center. The second Encore Event is a full-on rock concert with The Purple Xperience on Friday, Nov. 30. Bringing the spirit and sounds of Prince direct from Minneapolis, The Purple Xperience is the most authentic Prince tribute show in the world. Front man Marshall Charloff, who once recorded with Prince, channels the vocals and movements of the critically acclaimed icon in an unmatched, uncanny fashion, from his appearance to his multi-instrumental capacity on guitar and piano. This performance is sponsored in part by Lehmann Eye Center. With five Grammy awards between them, the bluegrass duo Dailey & Vincent returns to SFA on Tuesday, Dec. 11, with a brand new holiday concert: "A Springer Mountain Farms Christmas." Nationally known from their series on RFD-TV and their PBS special, the pair recently joined the likes of Garth Brooks and Blake Shelton as elite members of the Grand Ole Opry. As their three IBMA Entertainer of the Year Awards attest, bluegrass just doesn't get any better than this. Dailey & Vincent's performance is sponsored by part by Commercial Bank of Texas. The high-energy of stepping, a dance form that originated in African-American fraternities and sororities, comes to SFA with Step Afrika! on Friday, Jan. 25. One of the top 10 black dance companies in the U.S., Step Afrika! connects the stepping tradition to thrilling Zulu and South African dance forms and blends exhilarating styles, such as tap and hip hop, into its internationally acclaimed performances. The Washington Post says Step Afrika! "has elevated stepping to high art." The performance is sponsored in part by Nacogdoches Medical Center Health Network. The final University Series performance of the 2018-19 season features the music of the Villalobos Brothers on Thursday, May 9. These three irresistible siblings use their violins and voices to redefine contemporary Mexican music, masterfully blending elements of jazz, rock and Mexican folk. Their high-octane performances, backed by guitar, drums and guitarrón, have brought listeners to their feet in Latin America, India and Russia as well as Carnegie Hall, Harlem's Apollo Theater, Lincoln Center's American Songbook and the Latin Grammy Awards. The Villalobos Brothers' performance is sponsored in part by BancorpSouth. Season tickets for the 2018-19 University Series went on sale Aug. 1 and are $100 for adults, $80 for seniors, $50 for SFA faculty and staff, and $40 for students. "These are fantastic prices for entertainment of this quality," said Diane Peterson, SFA Fine Arts Box Office manager. "Season tickets provide a 20-percent savings over single tickets, and patrons can have their same seat throughout the season. "Plus, we offer season-ticket options," she said. "The classic package includes one ticket to each of the five performances, and the TixMix package allows patrons to create their own season." Single-event ticket purchases for the University Series, Encore Events or any of the other performances presented through the College of Fine Arts can be made beginning Aug. 15. Single event ticket prices for the University Series are $25 for adults, $20 for seniors, $12.50 for SFA faculty and staff, and $10 for non-SFA students/youth. Tickets for SFA students are $3. Encore Event tickets are $45 for Section A seating; $36 for Section B seating; and $27 for Section C seating. Discounts are available for seniors, students, children, and SFA faculty and staff.